Our piece a couple of months back on the comparative merits of parmo and poutine proved pretty popular with the gourmets among you looking for something new to wrap your laughing gear round after a robust night on the sauce. We're delighted, then, to offer another post-pub nosh deathmatch for your consideration, viz: kapsalon versus quesadillas. This time around, we've shifted our culinary emphasis from Middlesbrough and Canada to Mexico and Holland. Our new contenders have a couple of things in common: they're both easy and cheesy. In the case of quesadillas, the name's a bit of a giveaway regarding the cheese content of the dish, although kapsalon ("hair salon") doesn't really offer much clue as to what delights await the wobbly connoisseur of heart-busting late-night troughs. To clarify, quesadilla is uninspiringly described in the dictionary as a "filled fried tortilla" whose name derives from queso (cheese). Kapsalon owes its improbable moniker to a Rotterdam-based Cape Verdean hairdresser called Nathaniel Gomes, who asked his local kebab shop to knock up an unholy mix of chips, shawarma meat and gouda. Other customers quickly warmed to the idea, but since the delicacy had no name, Gomes suggested they order a "kapsalon", and the rest is history. That's the story, anyway, according to local lore, but what we want to know is just why the kapsalon has proved such a big hit with the Dutch, and indeed how it measures up to the quesadilla after a skinful of ale. So, let's get down to it. For this deathmatch, we requisitioned the kitchen of Begoña and Juanjo, owners of Bar Almanzor, in my local town of El Barco de Avila, as well as corralling a few of their customers as tasters. First up, we got stuck into the quesadilla. 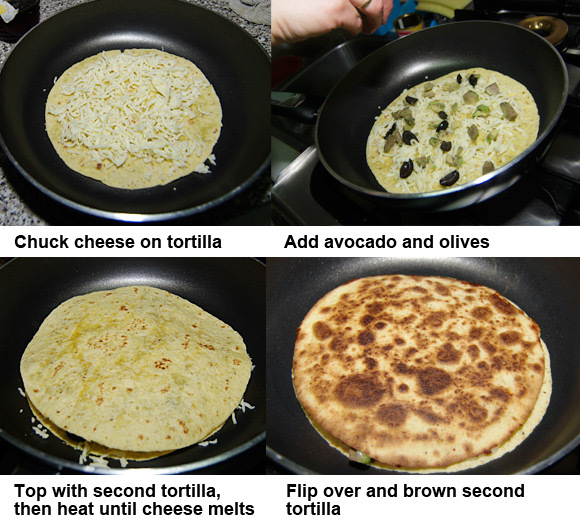 The dish can be summarised thus: corn tortillas + cheese + just about anything. The anything in this case was advocado and some black olives – the latter a concession to Spanish palates. Simple as that. Try throwing in some shredded chicken breast or chopped spring onion as an alternative filling, or in fact pretty well whatever you happen to have languishing in the fridge. Edinburgh's in Canada, right? No? Oh … umm … sorry?